There are several kinds of irregular shapes than an eye can take, each moving the focal point of the light away from the retina, resulting in a different form of vision impairment. When the shape of an eye focuses light in front of the retina, the resulting condition is called myopia, or nearsightedness. A focal point behind the retina is hyperopia. Corrective lenses are available for both conditions, and are designed to move the focal point to the surface of the retina, restoring clear and focused eyesight. Farsightedness is largely hereditary, but can develop in anyone. It's possible to experience symptoms even during childhood, but is much more common later in life. In fact, anyone above the age of 40 has a much greater chance of experiencing symptoms of hyperopia, with the likelihood growing every year. Aging doesn't necessarily cause the eyes to change shape any more, but it does diminish the eyes ability to flex enough to accommodate for the refractive error. Additionally, some forms of hyperopia can be causes by injury, drugs, or disease. It's common for farsightedness to be confused with presbyopia. Both conditions have similar results - difficulty focussing on objects that are near - but they have different causes. What are the Symptoms of Hypermetropia? Everything may seem clear and in focus when viewing at a distance more than a few meters away, but any closer than that and things may start to get blurry. The closer they get, the less focused they become. As it becomes more difficult to read and write, squinting will cause eye strain and fatigue, leading to headaches. If you're experiencing any of these symptoms, it's recommended than you make an appointment with an eye care professional. A comprehensive eye exam will help determine what kind of issue you're having, and what steps can be taken to get it resolved. Are there Different Types of Hypermetropia? There are, in fact, several different categorizations of hyperopia, depending on the root causes and how advanced the condition is. Below are the four main forms of hyperopia. Latent Hyperopia – When in it's early stages, and not yet fully developed. At this point, symptoms are just beginning to appear, and may not even be noticeable unless actively looking for them. It's at this stage where even a small amount of squinting is enough to correct the blurry vision. Low/Moderate/High Hyperopia – Once the condition becomes more developed, it can grow to three different levels of severity. Low hyperopia will have the least drastic change in eye sight, with a prescription measurement of +2.00D or below. Moderate hyperopia, follows next, with prescription measurements between +2.25 and +5.00D. Finally High Hyperopia will have the greatest effect on vision, and have prescription measurements of +5.25 or higher. Pathologic Hyperopia – Caused by irregular development of the structure of the eye, injury to the eye, or disease. 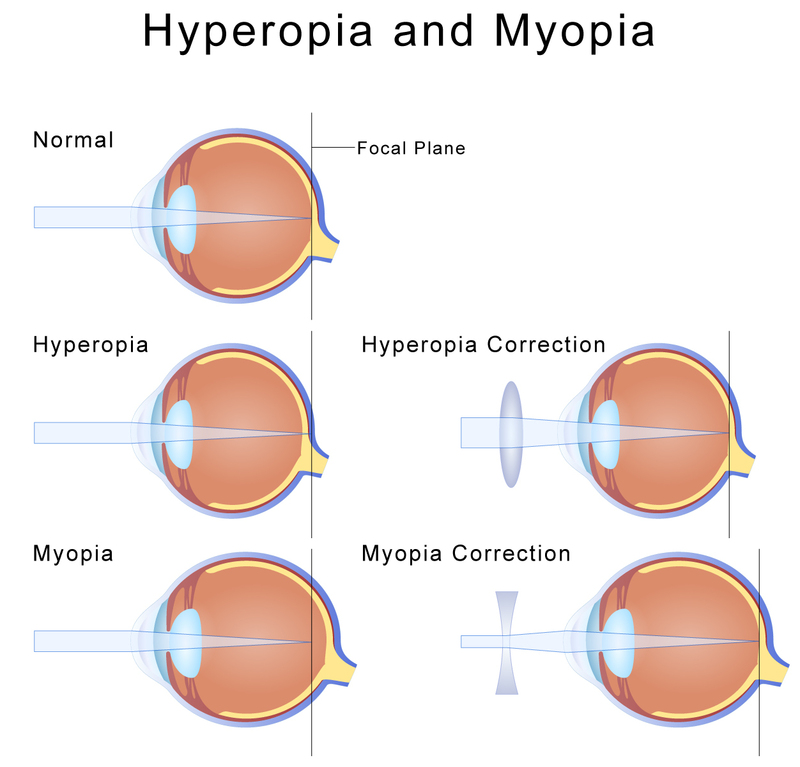 Some diseases that can possible lead to hyperopia are cataracts, microphthalmia, nanophthalmia, and aniridia. Functional Hyperopia – Unlike other forms of hyperopia, caused by an irregularly shaped eye, this form is caused by a failure of the muscles around the eye that would normally allow it to focus. How is Hypermetropia Detected and Treated? Farsightedness is not usually diagnosed in basic eye-screenings because those tests only measure the ability to see objects in the distance. If an individual is suspected to be farsighted, a more comprehensive Optometrist examination should be carried out to diagnose the condition. Corrective eyeglasses, contact lenses, and even surgery can all help to restore clear and focused eyesight. Each has their own advantages and disadvantages, though, and lifestyle, work environment, and personal preference all play a role in deciding which is best. You should discuss with your eye care professional which one is right for you. Eyeglasses are inexpensive and effective, but not always convenient. If you have an active lifestyle, or play sports, it may be difficult to keep them firmly in place. They come in many different shapes and sizes, and can be quite fashionable. With so many options available, it may take some time to find a set that's comfortable, but the right ones will feel like they aren't even there. Tinted lenses are also available, allowing you to stay protected from bright sunlight and damaging UV rays. Contact Lenses are much more subtle, providing no change in your personal appearance at all (unless you're looking to change you eye color). They're designed to be worn all day long, and removed at night. Different types of lenses can be worn for varying lengths of time. Some last for several weeks before needing to be replaced, while others are worn only for a single day before being disposed of. With proper hygiene and some practice, contact lenses are one of the more versatile options for people looking for corrective eye wear. Surgery is also an option. LASIK and PRK are two examples of surgical methods that reshape the surface of the eye, allowing it to refract light accurately without any need for corrective lenses. This is a more expensive method of fixing the problem, but it's also more permanent. The recovery time is usually only a few days, but only one eye is corrected at a time, so multiple visits will be required. For mild cases of farsightedness, you may only need to wear your corrective lenses when doing tasks at close range - such as reading or using a computer. Those who have more severe farsightedness, or who suffer from other conditions like astigmatism, may need to wear their lenses more often. It's also important for everyone to get their eyes checked on a regular basis because vision problems tend to slowly change over time. For those diagnosed with farsightedness, this will enable your eye care professional to monitor your condition and make adjustments to your corrective lenses prescription as appropriate. During your eye examination, you should be advised on how often you should wear your lenses to correct your hypermetropia. You'll probably be asked questions about your lifestyle and the type of work that you do in order to determine the best way of dealing with farsightedness. If you have been diagnosed with farsightedness and need corrective lenses, contact lenses could be the perfect choice: they're safe and easy to use and don't have any affect on your appearance. At Contactlenses.co.uk, we offer a range of contact lenses that will help farsighted individuals see clearly. And with our simple and fast service, you can order your new contact lenses without ever leaving the comfort of home. In addition, research into new and better ways of treating conditions like hypermetropia is constantly being done around the world, so if you'd like to learn about the most recent developments, be sure to check out the latest news.